Sleep apnea is a very serious type of sleep-disordered breathing that causes frequent cessations in breath. The most common type of sleep apnea, obstructive sleep apnea, occurs when the tissues at the back of the throat or the tongue partially or completely block the airway, impeding the normal flow of air. If you have sleep apnea, you may stop breathing 30 or more times a minute, every night. Your body responds to these cessations in breath by going into emergency mode: blood pressure spikes, heart rate increases and the adrenal glands release adrenaline. However, these physical reactions are not likely to wake you up. So unless you are aware of other signs of sleep apnea, you may be in the dark about sleep-disordered breathing. Read on as Dr. Samir Ayoub, who works with patients that have obstructive sleep apnea in San Francisco, reveals some of the signs that you could have a problem. Early diagnosis and treatment is critical. Left untreated, sleep apnea can increase the risk of health problems like high blood pressure, heart disease and stroke. Constant loud snoring is a common indication of sleep apnea. It occurs as air struggles to pass through the back of the throat into the airway. However, unless your significant other has pointed your snoring out to you, you probably don’t know that you snore. So, it’s important to be informed of other symptoms. 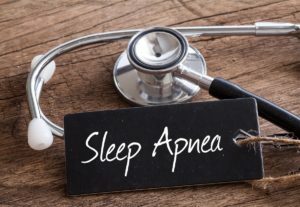 Another indication that you have sleep apnea is that you feel excessively sleepy or drowsy during the day, even if you were in bed for seven or more hours. This occurs because the frequent cessations in breath prevent you from getting the deep REM sleep your body needs to relax and recharge. Remaining in a lighter stage of sleep can leave you feeling overwhelmingly tired during the day. Lack of quality sleep and excessive sleepiness can have other cognitive side effects, too. As a result, you may experience memory problems, or have difficulty concentrating at work or school. Your mood may suffer if you don’t get the sleep you need on a regular basis. You could be prone to severe mood swings, anxiety and depression. Having a short temper is common due to lack of quality sleep. People with sleep apnea commonly report waking up with headaches. Frequent cessations in breath prevent the brain from getting all of the oxygen it needs at night. If you experience one or more of the abovementioned symptoms, you should be screened for sleep apnea. If a sleep study confirms a problem, Dr. Ayoub can fit you for an oral appliance to keep your airway clear at night and allow you the quality sleep you need. Call or email Dr. Ayoub today to discuss your concerns.